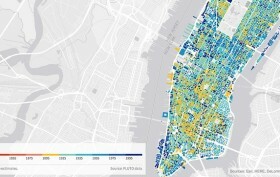 A new mapping tool called Urban Layers lets users see almost every building still standing in Manhattan today and reveals exactly when it was built. The data goes back as far as 1765. The interactive map by Morphocode provides insight not only into the history of a specific building, but into the evolution of entire neighborhoods, too. And for New York City history fanatics like us, this user-friendly tool is definitely going to come in handy.